Next to six new songs, the tracklist is completed with three covers. Well, 2 “covers”, since “Only When It’s Over” (a ballad, off ABSOLVA’s “Flames Of Justice” album, 2012) and “I See Red” (which rocks more, obviously, on FURY UK’s last album, “A Way Of Life”, 2010) are songs which Chris has (co-?)written. It’s nice to hear such songs in a purer, organic version. The album concludes with the OZZY OSBOURNE classic “Mama I’m Comin’ Home”, a rendition that is very well executed. 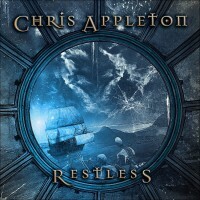 “Restless” takes off with the active “Seafarer”, in which Chris and Wizz take turns on vocals. All the songs aren’t that difficult, but Chris has an ear for catchy melodies and rhythms, that’s as clear as day. The groovy chorus is a highlight. While it’s an acoustic song, Chris didn’t forget to add a solo. “Crazyhead” is a midtempo song, beginning in a start-stop fashion, but then the right flow is found. While this is more of a Hard Rock kind of song, the music is quite funky and firm at the same time. Here as well, the vocal duties are shared between Chris and Wizz. “No Tomorrow” is another midtempo track, but one with a nice vibe and perfect when cruising on the road. Don’t forget to sing along with the chorus, because it’s one of those which allow for the listener/audience to join in. An instrumental bridge leads to the solo section, backed by a start-stop rhythm guitar. This creates a nice effect, obviously. Time to slow down then: “How Will I Feel When You’re Gone”. Here the music and singing is more solemn, with a touching chorus. The album takes a nice turn with the instrumental title track. It’s got frantic riffing and sounds very uptempo. Imagine it being turned into a proper Metal track… eargasmic! The melodic, midtempo chorus creates a bit of contrast, though, but this change is not disturbing. The ABSOLVA cover – not a happy song, I must say – is well done, but in a stripped-down version, when compared to the real new songs, it’s not as strong. But like I said, it’s nice to hear it in an alternative version. The situation improves again with the FURY UK cover, this time with Wizz on vocals. He did a good job, all in all. Last but not least: “Wonders Of The World”. This is a solemn song, driven by the piano and/or keyboards, since there’s other instrumentation as well in the music and I doubt they were real (hence keyboards): violin (leads), keys for atmosphere and melody, flute (? ), … Wizz was the man behind the microphone. While he did a good job with FURY UK’s “I See Red”, this time his efforts are less good (in my humble opinion), because of how he sings here. His tone/timbre is not one that works well (enough) with the music. In short: Chris and co. did a very good job with this acoustic album. It’s an interesting way to listen to new and older songs, not just from a listener’s point of view, but also while it allows other musicians (drummers, keyboardists, …) to play along, fill the gaps, add own ideas and make the puzzle more complete. More bands should at least once in their lifetimes release acoustic albums, on which one or more instruments are left out. Regardless of this change, “Restless” is a recommended album, without question!